We have mentioned this freebie before, but the website has been updated since then and the samples are still being offered so I felt it was time for a refresher! 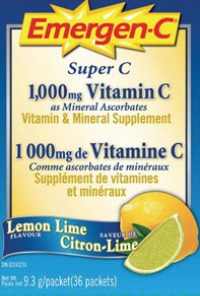 Emergen-C is a flavoured vitamin and mineral supplement you mix with water and drink. It is made by Vitascorb, and they are offering free samples! According to the website it, "boots your immunity, increases your metabolic function, and ignites your energy level to help you really feel the good." As you can see, this baby is loaded.